What Welding Is Used for Aluminum? Although plasma arc welding (PAW), electroslag welding (ESW), electrogas welding (EGW), and resistance welding (RS) can all be used on aluminum, the most common processes for the metal are shielded metal arc welding (SMAW), gas metal arc welding (GMAW), and gas tungsten arc welding (GTAW). These three processes can be utilized on the widest range of aluminum metal thicknesses. 2 Following are a few considerations for each of the most popular aluminum welding processes. SMAW: While SMAW is a relatively inexpensive process that doesn’t require extensive equipment, it generally requires a high level of welding training and much practice to master. Perhaps more importantly, the process is not well suited for thin metals. GMAW: GMAW is often used in manufacturing because it is a quick welding process that can be easily learned. The process is great for metals of thin to medium thickness. However, it’s not the cleanest choice and can cause sparks, fumes, and smoke. What Are Some Aluminum Welding Tips? There can be challenges to welding aluminum. 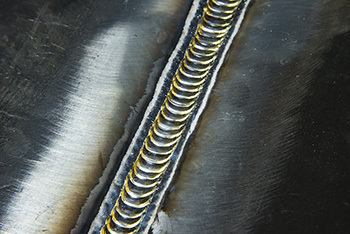 Following are some of the common issues with welding the metal along with techniques for addressing them. Aluminum’s high thermal conductivity can cause the metal and its alloys to quickly conduct heat away from the weld area. This can result in a lack of fusion at the start of the weld, especially for the GMAW process. 4 This problem can be avoided by applying heat to the weld area much more quickly to bring the metal to the appropriate welding temperature. 5 Some GMAW equipment automatically increases temperature at the start of the process to prevent lack of fusion. At the same time, too much heat can build up due to aluminum’s high thermal conductivity, resulting in warping or burn through. Traveling at a faster speed with the GMAW gun can help welders avoid these problems. Aluminum is one of the metals that are most susceptible to weld porosity. 6 Porosity occurs when gas becomes trapped in the metal as it solidifies, causing cavity-like discontinuities. 7 Rigorous cleaning of the base and filler metals can prevent porosity. Welders can employ three types of cleaning: solvent degreasing, mechanical cleaning, and chemical etch cleaning. Solvent: Use organic solvents to remove dirt, oil, and grease from the metals. Mechanical: After degreasing the metals, scrape or file away surface oxide or contaminants with a wire brush made of stainless steel bristles. Chemical: For batch cleaning, apply a 5 percent solution of sodium hydroxide and then rinse the metals with nitric acid and water. Cracking: There are two types of cracking to watch out for when welding aluminum: hot (solidification) cracking and liquation cracking. Either type of cracking can cause welds to fail, as well as to not meet code requirements. As you can see, three of the fundamental welding processes, SMAW, GMAW, and GTAW, can be used with aluminum. While the metal has widespread industry applications, there are also some challenges to working with it. As you advance in your welding classes, you’ll likely learn more about aluminum welding.